Recently, I put together a floral centerpiece for my One Room Challenge Reveal HERE using roses, greenery, eucalyptus leaves and floral foam. I want to show you how easy it is put one together yourself, anyone can do it. I don’t have any formal floral training, although I would like to take a class very much. Until then, I am playing around with different tools, vases, and flowers. 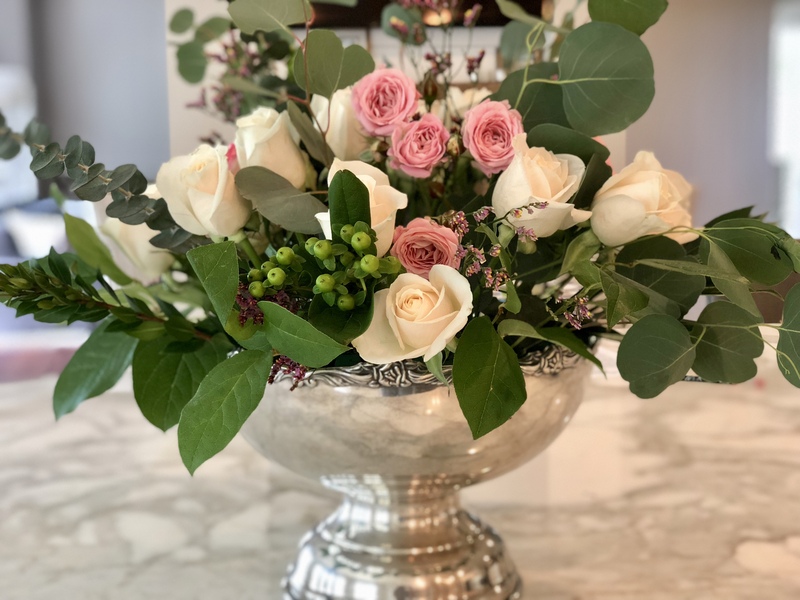 For my arrangement, I used a silver punch bowl like the one HERE. I am also using floral foam (HERE), make sure to use the type that absorbs water…wet foam…dry foam will not absorb water. One brick of foam fit perfectly into my bowl, then I cut another piece into 2 smaller pieces for the sides. You can place a few pieces of tape on top of the bowl to secure the foam in place, but it is not necessary. Before inserting the foam into the bowl, soak them in water. Prepare the roses by trimming the stems to the proper length and remove the leaves. Be sure to leave enough length to secure the stems into the foam…better to leave them a bit too long than cut too short. You can always go back and cut a bit more if desired. Begin assembling your arrangement by adding the largest blooms first. Working in threes, stick three roses into the foam. If possible, use roses that are partially open for a fuller looking arrangement. Continue adding roses, at varying heights, to fill the remaining space. You want to create dimension and give your arrangement an organic look. Add the spray roses, which are already in a set of three. When you are done with the roses, begin adding filler to your vase. Fill in the bottom edges with stems of leaves. Continue adding filler to your arrangement, like eucalyptus branches and berries to give the arrangement a more finished looking appearance. Voila! A beautiful arrangement you can enjoy in any room of your home. Playing around with floral arrangements is fun, don’t be afraid to get creative and play with different colors and flower varieties. You’ll see how easy it is to make a professional looking arrangement at a fraction of the cost of what you would pay in a store. I love this! Will have to try it! Thank you! Much easier than it looks..anyone can do it 🙂 Thanks for visiting! The roses and silver are so elegant. I have the perfect piece of silver and will follow your directions. Thank you so much!! You are very welcome Sandra, happy I could help! Thanks for visiting!